Gerry Schwartz purchased a T206 Magee on eBay (left) under handle of "PSA-Card." That same card appeared in June 2013 as the "Magie" error variation (right) at the Mile High Card Co. Earlier this month we published a report about the two bogus T206 Sherry Magie error cards that were authenticated and encapsulated by PSA and then offered for sale at Mile High Card Co. and in Probstein123’s eBay auction. Joe Orlando of PSA bought back the fake sold at Mile High for over $16,000 while Rick Probstein withdrew the other fake from his sale and sent it back to the PSA offices in California. Now new evidence has emerged showing that both of the bogus cards were originally purchased as common T206 “Magee” variations on eBay by dealer Gerry Schwartz of Shirley, New York. In addition, a source tells Hauls of Shame that one of Schwartz’ Magee cards was also submitted to Sportscard Guaranty (SGC) as an altered “Magie” error variation. Hauls of Shame contacted Gerry Schwartz by phone and email and asked if he could comment or offer any additional information as to how the cards he purchased on eBay ended up being submitted to PSA as T206 Magie error cards. Schwartz did not respond to our inquiry. Schwartz purchased the two Magee cards under the eBay ID “psa-card” and has also used the ID “syzygy3.14″ dating back to 2001. Gerry Schwartz has an eBay ID history using the names "psa-card" and "syzygy3.14" SGC President Dave Forman (right) says his graders recently examined and rejected a sophisticated Magie forgery. The new Magie fakes are far more sophisticated than the Doyle forgeries uncovered in the past like the Olbermann example. Back then a more professional Doyle forgery was encapsulated and deemed authentic by PSA and appeared in a company published coffee-table book called Collecting Sports Legends-The Ultimate Hobby Guide. At that time collector Corey R. Shanus asked other collectors on the Net54 collector forum: “If the entire player/team lettering on the bottom of the card is erased, can that erasure be detected? I ask because it occurs to me that if it cannot, then what’s to prevent a skilled crook from erasing a “Magee, Phila. Nat’l” and replacing it with a “Magie, Phila. Nat’l”?” Shanus asked that question five years ago and the only thing that prevented these two fakes from retaining their fraudulent authentic status was the vigilant eye of several collectors. In 2000 SCD reported on a fake T206 Doyle purchased by Keith Olbermann (left) and years later a more sophisticated Doyle forgery was illustrated in a PSA coffee-table book from 2009 (right). Schwartz has also been associated in the past with dealer Gary Moser who claims he “was one of the first dealers to send (his) cards out and allowed a third party to determine grade.” In the past Moser has also been accused of selling altered and trimmed cards to collectors. In one such case, collector Marc Schoenen claimed that Moser had sold him, “A large number of high-grade GAI 1955 Bowman baseball cards that were independently verified later as having been trimmed, re-glossed, or a combination of both.” Schoenen confronted Moser on the Net54 board in 2008 and asked him, ”Are you planning on letting us all in on the secrets as to how you managed to perpetrate these alterations and get them past a professional grading company?” We asked Schoenen if he ever had similar problems with Schwartz and he replied, “My problems were always with Moser, specifically, but I believe they’re a tag team.” Schoenen also said he plans on having his own T206 Magie card re-examined to make sure it is authentic. 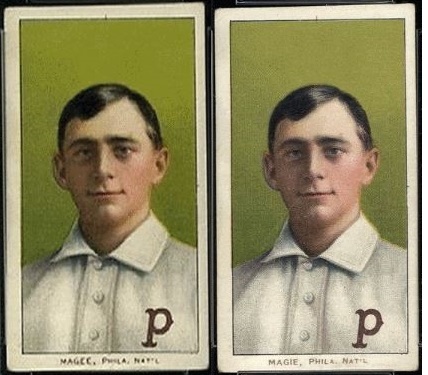 Hauls of Shame has not been able to confirm whether the two T206 Magie fakes are currently being investigated by either local law enforcement or the New York office of the FBI. Should we hold our breaths in anticipation of a full scale report by PSA into how these cards got certified as real Magie error cards? I am sure Joe Orlando plans to ease the hobby’s collective angst by telling us what happened and what they plan to do in the future to make sure something as egregious as this does not happen again? For being the president of PSA, Joe O. sure is non- responsive in these matters. Why is silence their answer for virtually every occasion like this? Mr. Orlando? You’d think Schwartz would have responded if he wasn’t involved. Its gold Gerry, it’s gold!!!! This is grand larceny !!!!! People pay their hard earned money for a hobby they love . The authorities should get involved to protect this fine hobby , and make some people pay for stealing behind closed doors . Jail and a stiff fine will make creeps think twice about manipulating sports cards . He thinks he can get away with it because all he is doing is not obeying the hobby protection act of 1972, it’s a grey area but a good lawyer should be able to nab him.